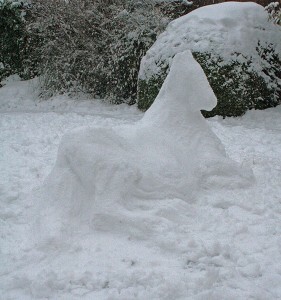 I generally stay as far away from snow and ice as possible but, in a quick burst of enthusiasm last week, I did manage to make this snow pony. A lovely thought then crossed my mind that I could fill the village and surrounding fields with similar white animals, perhaps helping to clear the pavements of fresh snow in the process. Then again, I really don’t last more than a very few minutes outdoors in such frozen weather so this is unlikely to happen. Keep your design simple, especially the weight-bearing parts of it. This may mean planning your animal so that it is in a resting position. Use snow shovels and buckets to gather sufficient snow before you start modelling. I used freshly-fallen untrodden snow from the driveway. Snow gathered from the tops of walls, hedges, etc. is also very useful. Pile the snow up into a simple heap at the site of your planned sculpture. Use gloved hands to mould the base of your animal shape to the desired length, width and height. In this case, I started with the body of the horse, and corrected the width and length of this before adding legs and neck. Make sure that the snow in the base of the animal is compressed together sufficiently without large air pockets. Then attend to the neck or upper body of your figure. How far back should it extend along the animal’s body? How wide should it be? Refer to photos or drawings, if needed, to help answer those questions. In adding more snow higher up the figure, there is a risk that large chunks of your sculpture will break off. To reduce this risk, add only small handfuls of soft, fresh snow at a time. Don’t compress snow in your hands before adding it to the sculpture. 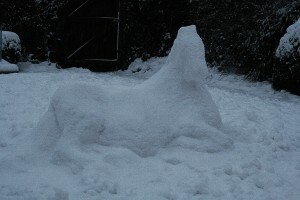 The head of the snow animal is tricky to build because it is not fully supported and sections can therefore break off more easily. 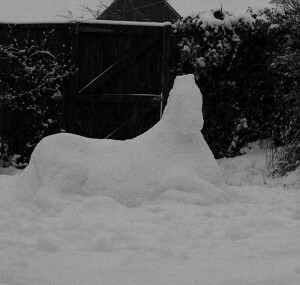 Be sure to add only very small amounts of snow at a time when working on the head. I kept the head very simple. Attempting to add features to it would risk causing chunks of snow to break off. If making any adjustments to the shape of the head, use your free hand to support it while you work. My resting horse had legs stretched out over the ground. Where should these limbs join the body? Use reference photos or drawings to help make this decision before starting to carve them. I made temporary finger-marks in the body of the horse to clarify where the limbs would branch off. Also check the angles at which the limbs should stick out from the body before modelling them. Remember to walk repeatedly around your whole sculpture and adjust as required from all sides. Once you are happy with the shape of the figure, use both hands to smooth and compress the surface of the snow, especially over the lower parts of it. Don’t “fiddle” too much with the head or other unsupported sections as they are easily broken.